Note the change of day, time and location! Friday February 22nd at 7 pm at the Memorial Congregational Church at 26 Concord Road in Sudbury. Evelyn Vanderhoop will be arriving at 6:30 to set up and have some chat time before the program starts promptly at 7. The Nashoba Valley Weavers’ Guild and the Boston Area Spinners and Dyers are jointly hosting an evening presentation by Evelyn Vanderhoop, Haida weaver. 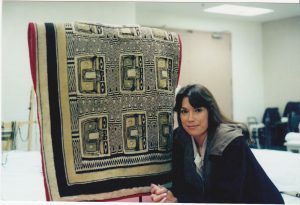 Evelyn and her family carry on the long textile traditions of the Haida, a Northwest Coast people, with a particular interest in Raven’s Tail Robes. She has spent several years researching this almost lost technique of weaving. The Boston Museum of Fine Arts commissioned Evelyn to weave a traditional Raven’s Tail Blanket for their collections, and she will be presenting the robe to the museum in February. Evelyn is going to dance the robe at the MFA at 11 am Wednesday, February 20 (probably gallery 168). She will give two programs at the Museum that will include materials and demonstrations of technique on Thursday, February 21 (one hour each; one in late morning and one in early afternoon). We have invited Evelyn to speak to our two Guilds (and other invited guests) about the history of these robes and the processes involved in making them. While the MFA’s Raven’s Tail Robe will not be part of her presentation (it will already be a accessioned into the museum’s collection), she will include some materials in her talk. This is a very special program and speaker, and we’re very excited about being able to host this event! Note that this is in place of our regular 4th Tuesday meeting. There will be no meeting on 2/26 at the Fiber Loft. In addition, a video is being made. There may be some filming at our event, and we may get to see some previews of the work in progress!